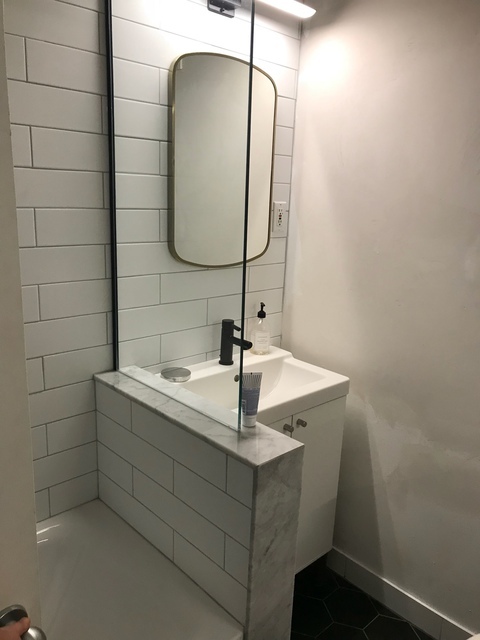 " THANK YOU CERASTONE "
We couldn't be happier with the Bathroom Reno from the friendly hands on management to the respect highly experience shown by Michael & his team. Our Experience has lead us to contracting Cerastone for a larger full kitchen and living room Reno. We highly recommend Cerastone for your home improvement. 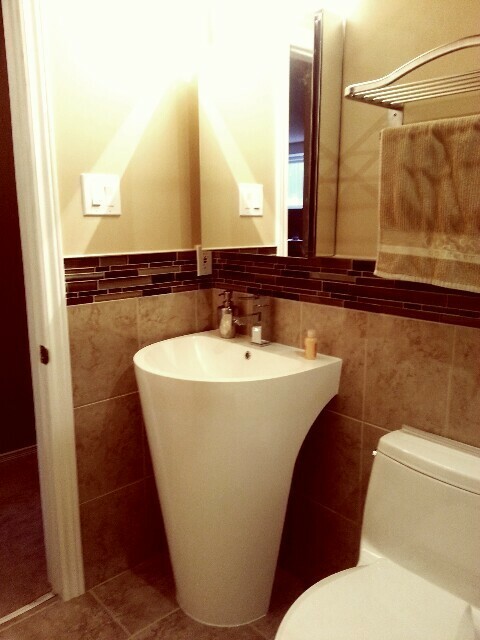 I had Home Depot and Cerastone do full bathroom reno for me in Mississauga after seeing the bathroom they did for my neighbour, which was beautiful. 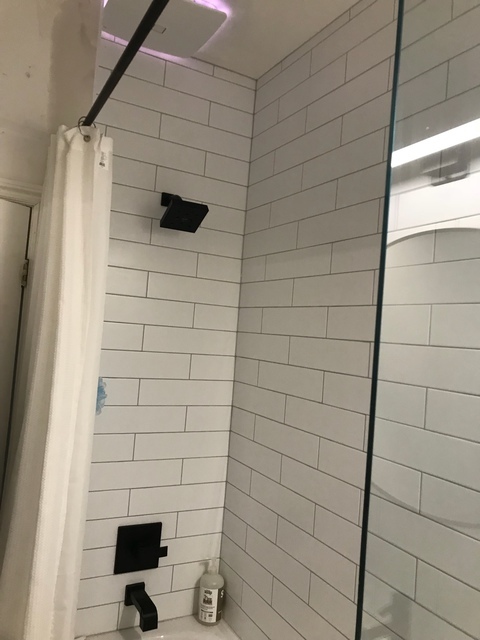 I didn't realize they did full bathroom renovations, but they were able to look after everything including plumbing, tiling and electrical upgrades and got a permit (which I was happy to see). 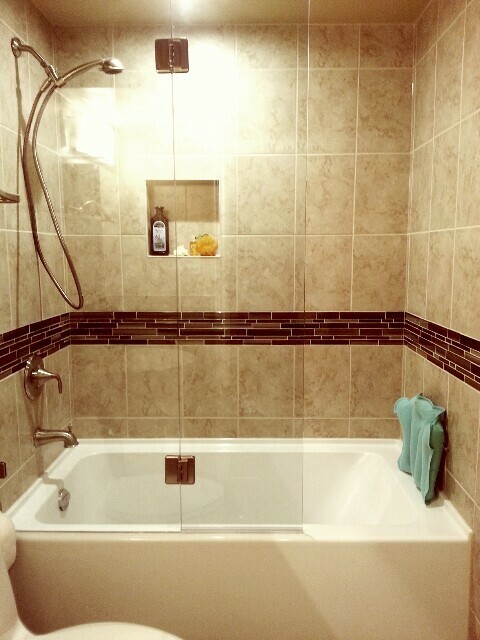 I had them do fairly complicated tile work for the shower walls which came out great. They spent a lot of time making sure everything was waterproofed properly from what I could see. They had the vanity custom made for me and it was well built with full extension drawers and stone top. The workers were very clean and polite and they made sure they had drop cloths covering all my floors right out to the front door. There was a project manager, Charlie who kept the workers busy and made sure everything ran smoothly. I was able to go to work let Charlie worry about project and he kept me up to date. In the end, Cera Stone handled everything start to finish, including paint. It was a little more money than some of the quotes I got but the service was much more complete than others were able to offer, so I ended up spending wisely I feel. It couldn't have gone better. I am already planning my next bathroom with them for this summer. 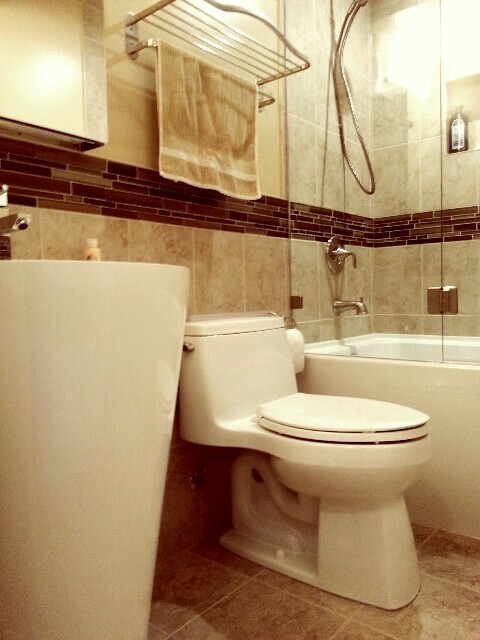 We had our ensuite bathroom renovated by Cera Stone through Home Depot. It was a fabulous experience!!! Right from the get go, our sales rep walked us through the entire design layout, helped us with our selections and gave us some great advice on our new bathroom layout. We had Tony as our project manager and he was fantastic. He started off the project with us on day one and stopped in a few times a week to ensure the crew was on track. The crew leader -Bill was amazing. Our home was treated with respect and they kept it extremely clean. When they finished up at the end of each day they cleaned up so well that you wouldn't even know we were under renovation! Finished product looks better than what we imagined. We can't say enough good things about this company and Home Depot. Already working on designing our main bathroom!! Please please read the reviews on this company left by Allison and David on this site about this company before you sign up. All is true in our case and a whole lot more. Every installation that these guys did was of a poor quality. Project manager was incompetent. Rarely supervised his workers on a daily basis and never checked their quality of work. Rarely any of them cleaned up at the end of the day. I asked over and over but no. We had to do the cleaning ourself since we were living there. Even at the end they did not bother. Poor delivery of their job. I had to ask for everything to be redone. They redid everything two or three times before getting it right. They have some good workers but overall, stay away or be prepared for a mess of a renovation and a whole lot of redoing. A 6 week project went on for almost 5 months. They are still not done. I have lots of pics from their low quality of work and I can go on and on writing about it . I gave them 2 since they redid their work. We went with Cerastone because they were the Home depot installers. We got a few quotes, and this one came in mid-pack. Our first meeting with Antonio went great. As I've come to know is common, the budget was presented to us with allowances that we simply not attainable unless you wanted poor quality finishes and fixtures. (I should have known better!) So, right away, the budget was off. The part that it fell apart was in the installation. The workers were awful. They were messy and had zero care for quality. There were several issues - from mislaid tile (they did take it off to do again) to a mirror that was installed too low (you couldn't see your full face in it) to new plumbing not lining up to the sink to the toilet not being centred between the sink and bathtub (we moved all the plumbing and the company had the new measurements). There were several more items that were detailed in a three page word doc that was sent to Home Depot to lodge a full complaint. Additionally, there was no clean up at the end of the day. Heck, one time they even let our house cat out even after we asked that the door remain shut (we now keep our cats in our room whenever we have contractors in the house). The project manager was not very respectful of what we wanted - for example, I wanted to keep our wall vent and cover (it's a 100 year old house and it was lovely). He told that it was a piece of junk. He also installed the vent a full subway tile up the wall, and told me it'd be easier to clean like that. I insisted on moving it down, which they did, but they just tore through the drywall/tile. I had to ask again to finish it, so that you couldn't see rough side through the vent. Overall, they just did not care. We signed on expecting a general contractor to handle the day to day - but every night we got home from work to a new issue that we had to fix. This was the most drawn out, stressful renovation that we've ever had. The funny thing too was that they knew we had a whole house to do, so they could have gotten a tonne of work out of us. Overall, they under budgeted, there was no help/advice, there was no quality control, the timeline was blown to pieces, and they made large and small mistakes. As you can tell, we were very unhappy with the project. It took a long time to get them to come out and fix the deficiencies. We used Cera Stone for our main floor renovation that included a full kitchen renovation, removal a load bearing wall and leveling and installation of the floor. Cera Stone was fantastic from beginning to end. There were numerous complexities that arose during the job and the Cera Stone guys handled each one with professionalism and innovation. Tony our project manager was excellent. He took the time to answer all of our questions throughout the job and we greatly appreciated his attention to detail. All of the tradesmen who came to our place were polite and cleaned up beautifully. Of particular note were Danny (builder) and Dino (plumber). Joe, the owner was great to work with as well. We feel we got excellent value for our money spent and our kitchen looks amazing - better than we could have imagined. Against my better judgement my wife convinced me to use Home Depot and their installer Cera Stone, as they would stand behind their product and service. Needless to say after they butchered our flooring job the are no where to be found. 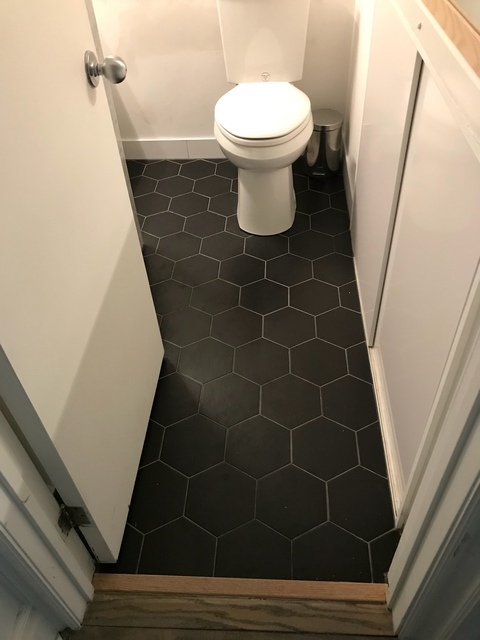 the install was August 5th and the reinstall August 8th, oh yah did I forget to mention they laid the tile in the wrong direction and had to tear it out to correct the problem. Needless to say they left us with a half inch rise over the hardwood floor and butchered the baseboard install. the amassing thing it now November 17th and nothing has been do, take a look and you be the judge. Just try to save you from making the some horrific mistake we did. Completed in less than 4 days, the condo looks amazing. Excellent work - good value for the money. Would recommend any time. Loved the way they cleaned up each day. Cera stone removed our marble tiles and installed a limestone floor. Also re finshed our powder room. Job looks great and house was kept very clean durning the very dusty removal of the old tiles.